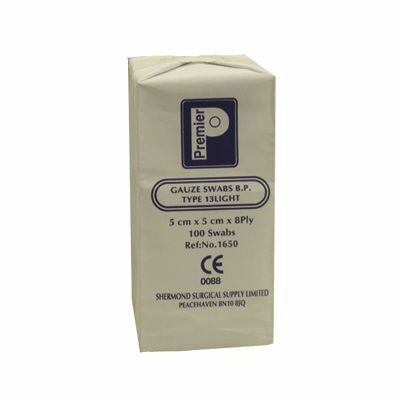 Keep your First Aid boxes fully stocked and ready for any accident with our Gauze Swab 5cm x 5cm 8ply 100. Provided in a large pack - ideal for busy and high-traffic businesses - these non-sterile woven swabs have an 8ply construction that effectively works to absorb fluids and moisture from any wound. Their medium dimension makes them perfect for cutting down to size or using to cover mid-size injuries while the super absorbent construction promises to both cushion and protect your patient from dust, dirt or additional infections. Our Gauze Swab are also available to purchase online in a smaller 10cm x 10cm dimension - suitable for smaller First Aid supplies or smaller injuries.